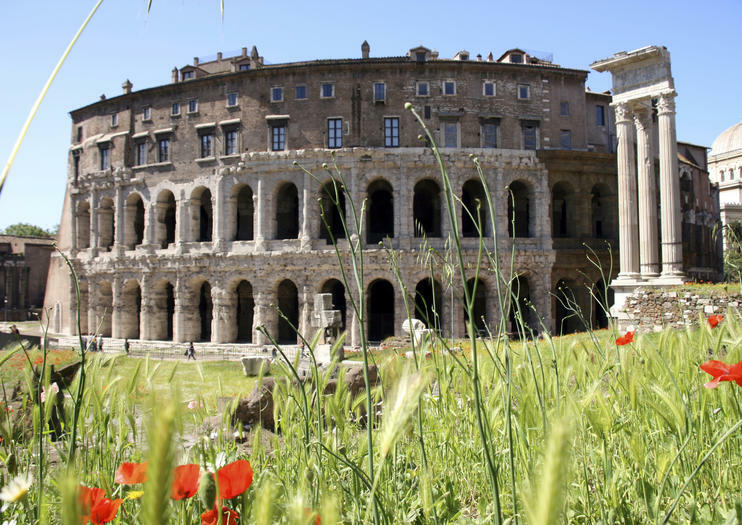 Though this ancient open-air theater resembles a mini-Colosseum, it was built nearly 100 years earlier during the final years of the Roman Republic. Named by the Emperor Augustus in 11 BC after his deceased nephew Marcus Claudius Marcellus, the theater may be the oldest surviving of its kind in the world. Visit the outdoor Teatro di Marcello to view its archways and tiers, arranged in a semicircle. Its third tier was lost in Medieval reconstruction, but you can see ornamental Doric and Ionic columns on the lower tiers. The theater once held up to 20,000 spectators and was one of the largest entertainment venues in the ancient city. Like many ancient Roman ruins, the Teatro di Marcello is best appreciated on a guided archaeological tour. Join a small-group walking, Segway, or e-bike tour of Rome’s most important ancient sites, most of which include skip-the-line entrance to the Colosseum, Roman Forum, and Circus Maximus along with a visit to the outdoor Teatro di Marcello. A visit to the theater can easily be combined with a food tour of the nearby Jewish Ghetto. Most of Rome’s archaeological sites are open-air, so wear a hat, sunscreen, and comfortable shoes on an ancient Rome tour. A visit to the theater is especially fascinating for Roman history enthusiasts. Due to the uneven and unpaved grounds, the outdoor site is not accessible to wheelchair users. The theater is no longer used as a venue, but small concerts are held on grounds with the structure as a backdrop. The theater can be found on Via del Teatro di Marcello near the banks of the Tiber River and east of Rome’s Jewish Ghetto through the Portico d’Ottavia. The nearest metro stop is Colosseo. The archaeological site is largely open-air, so visit when the weather is clear and not too hot. In summer, arrive first thing in the morning or in the late afternoon to avoid the midday sun. Teatro di Marcello was built almost a century before the Colosseum, and there are differences. Where Teatro di Marcello was semicircular, the Colosseum's amphitheater forms a complete circle. The Colosseum held more than double the spectators, had an additional tier, and had a complex stage and underground technical area. The smaller Teatro di Marcello did offer a view of Tiber Island and pioneered the use of fired bricks in Roman construction. Immerse yourself in Rome on this comprehensive all-day guided tour. The small-group excursion (with an eight-passenger minivan) allows you to enjoy the main attractions comfortably and easily. The itinerary includes visits to the Arch of Constantine, the Colosseum, Victor Emmanuel monument, Capitoline Hill, the Spanish Steps, the Roman Forum, Trevi Fountain, and more. Maximize your time at port with this full-day private shore excursion in Rome. Meet your English-speaking guide at Civitavecchia, and set off on a carefully curated day of sightseeing designed to match your interests. Imagine the age of gladiators and emperors with a visit to the Colosseum or Roman Forum, explore Baroque piazzas and fountains or admire the awe-inspiring art collection at the Vatican. Whether you want to see ancient highlights or hidden gems, your guide will help you make the most of your day in Rome. See the best of Rome in a 3.5-hour small-group tour by Segway. Explore the highlights of the Eternal City with ease on a Segway, including the Roman Forum, Circus Maximus and the famous Colosseum, along with some unexpected attractions along the way. See the Palatine Hill, Roman Forum and Colosseum with a self-guided tour at your own pace. The magnificent ruins of Ancient Rome are dotted all around the city, but the labyrinth streets and cobbled lanes of the historic center are not always accessible to vehicles. Saddle up for this 3-hour bike tour of Rome instead and tick off top attractions such as the Colosseum, the Pantheon, the Trevi Fountain, and Capitoline Hill. Uncover the secret side of Rome as you venture off the tourist trail on this 3.5-hour tour. Stroll the streets of the historic Jewish Ghetto, peek inside the gigantic Circus Maximus and follow part of the Ancient Roman Appian Way. Then, explore little-known historic sites like the Park of the Aqueducts and the Baths of Caracalla; look out over the city from Janiculum Hill and enjoy a unique view of St. Peter’s dome. This small-group tour is limited to 15, ensuring a personalized experience. With so much to see in Rome, a bike tour is an ideal way to cover lots of ground while saving your feet from fatigue. On this 3-hour, 2-wheeled tour, hop onto a quality bike and follow your local guide through the city’s most charming piazzas and interesting neighborhoods. Starting near the Colosseum, follow a route that takes you past ancient monuments like the Imperial Forum and along the Tiber River while your guide shares legends from the city’s rich history. Rome is a sight to behold from any angle, with its ancient monuments and Renaissance architecture. On this 2-hour Segway tour, you’ll zip along cobbled streets and through bustling piazzas in search of the Eternal City’s most spectacular viewpoints. Head for the hills for unparalleled vistas of the Tiber River and Rome’s dome-dotted cityscape; discover a secret spot from which to see St Peter’s Basilica; and get panoramic views of Circus Maximus, the Colosseum and other star attractions. This small-group tour is limited to just six participants, ensuring you’ll receive personalized attention throughout. Experience a side of Rome rare to visitors with a mosaic-making workshop in the heart of the city—all materials included. Your instructor, who ensures that everyone in the class is attended to, teaches you little-known techniques used by 19th-century artisans who made gifts for the pope. The workshop leaves you with a unique souvenir to remember your stay in Italy. Discover the landmarks of Rome’s historical center on a Segway tour along the city’s charming streets. With the ability to cover more ground than a walking tour but still be outside, a Segway is the ultimate way to see Rome’s many attractions, from the Spanish Steps to the Trevi Fountain to the Pantheon. Pass by squares like Piazza del Campidoglio and Piazza Navona, and learn about Rome’s rich history from audio commentary. Limited to eight people, this tour provides a small-group experience with a tour leader. Select a departure time when booking. Explore the marvelous ancient Rome.Our local tour guides know Rome and its monuments like the back of their hands and will take you to see the most famous sights as well as hidden treasures.Ideal for families, friends and couples who would like to enjoy private Rome tours on Segway with a most personal flair. You can also decide to visit the great historic city center or to discover the hidden treasures in the charming Trastevere district. Go back in time on a walking tour of the historic Roman-Jewish Ghetto, established in 1555. Your guide eliminates the hassle of navigating on your own, bringing you to the area’s most popular destinations. Visit the open-air Theater of Marcellus, Bernini’s turtles in Mattei Square, the Synagogue, and the Jewish Museum before stopping for a taste of Roman-Jewish cuisine. Enjoy the best of Rome on a 4-hour tour with a Dutch-speaking guide. Cycle through Rome, discovering its ancient monuments, fancy shopping streets, beautiful churches and fountains. The tour route will provide a reminiscent view of Rome's main attractions, plus some hidden squares and little alleys that are less common among tourists. For a leisurely, yet authentic, look at Rome, this tour should not be missed. Rome might be most famous for its ancient ruins, but the Italian capital also has a rich Jewish heritage. On this 2-hour walking tour, see the remains of the former Jewish ‘ghetto’ and learn about its transformation into one of the city’s liveliest neighborhoods; visit the Porch of Octavia, and Tiberina Island; and sample traditional Jewish pastries. Cruise through Rome to check out its ancient and baroque sights on a Segway tour. With the ability to cover more ground than a walking tour but still be outside, a Segway is the ultimate way to admire Rome’s famous attractions like the Spanish Steps, Trevi Fountain and Colosseum. Visit lively squares like Piazza Navona, and learn about Rome’s rich history from audio commentary. Lunch with wine is included. Limited to eight people, this small-group tour provides a more personalized experience. Customize your own sightseeing itinerary of Rome on this private tour with a driver who will transport you to the attractions that interest you. Perhaps visit Palatine Hill, the Pantheon, Mouth of Truth, Circus Maximus, Piazza Navona or the many other historical landmarks that make up the Eternal City. Listen to commentary from the driver when you’re in the vehicle to learn more about Rome’s famous sights. Retrace the path of ancient Rome's victorious generals on a 3-hour Segway tour of the legendary Road of Triumphs. Follow the route that Roman armies and their leaders used to re-enter the Eternal City after a conquest, passing by iconic monuments like the Gate of Triumphs, Circus Maximus, the Colosseum, and the Roman Forum. Hear tales from Rome’s military history as you zip through the city streets with ease. Explore Rome’s Trastevere district, one of the city’s trendiest neighborhoods, on a Segway tour, which provides the ability to cover more ground than a walking tour but still be outside to soak up the atmosphere of this lively historical quarter. With a guide, cruise along the maze of cobbled streets to see piazzas and sights like the Fountain dell’Acqua Paola on Janiculum Hill. The tour ends with lunch at a local eatery. Visiting Rome with kids? Bring the whole family on this fun and interactive 3-hour tour designed by educators for families traveling with little ones ages 6-12. Kick things off at the Arch of Constantine, then beat the crowds with priority access to the popular Colosseum and Roman Forum. Kids get a booklet with games, puzzles and a treasure hunt to keep them engaged while learning about life and legends in the ancient Roman Empire. It’s a great introduction to the Eternal City that both kids and parents will love!